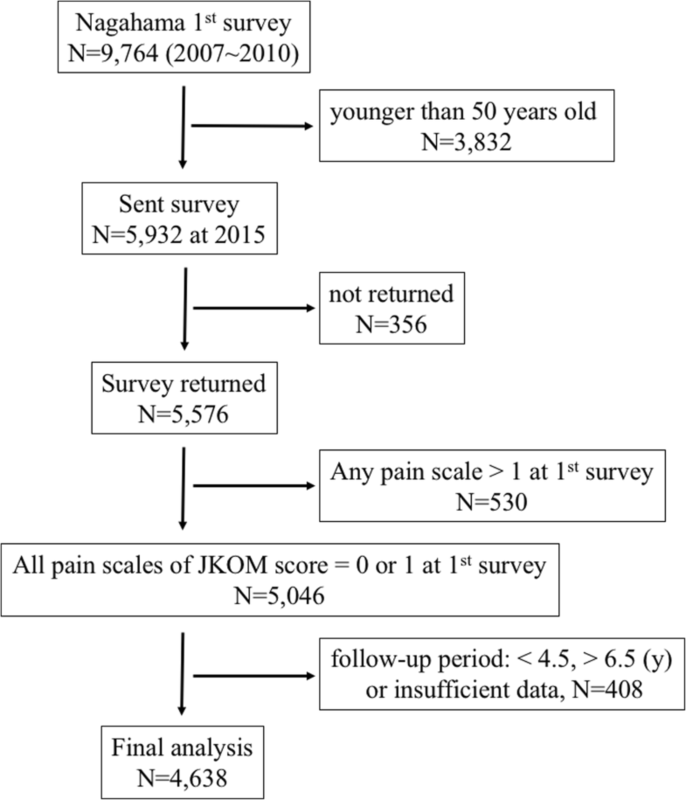 To detect those at risk of knee pain, several scores and formulae have been proposed [7–9]. However, few of these are applicable to people who do not yet have knee pain but who are likely to develop symptoms later. Awareness of factors that are applicable to these individuals is crucial for developing a formula to predict the development of knee pain. One of possible pathophysiological mechanisms of this association is that osteoarthritic pathology can affect any joints or body parts in the older population, especially, load-bearing organs such as the knee and the lumbar vertebrae. From a clinical point of view, it is not exactly known how preceding low back pain/disability can predict new knee pain, but it is conceivable that one tends to affect the other by worsening the load-bearing burden of the other and/or by loosening the balance of the body when walking and even standing. Indeed, it was shown that the number of painful sites outside the knee, including low back pain, independently predicted knee cartilage volume loss without knee OA [22, 23], which indicates the crucial association between musculoskeletal pain at different sites. Pain is one of the central issues in the management of knee OA [24–26], and this association should be investigated in future studies. Several meta-analyses and reviews have shown that metabolic syndrome and dyslipidemia are risk factors for knee OA [28–30], and a large-scale study has also shown that OA is a significant risk factor for cardiovascular diseases . Therefore, we decided to include the ABI, which is a reliable, objective measurement of peripheral artery disease . Contrary to our expectations, no significant association between the development of knee symptoms and ABI was apparent, possibly because ABI alone is not sufficient to predict new knee symptoms, or because knee symptoms, unlike radiographic OA, may not be directly related to vascular manifestations such as arteriosclerosis. In addition, a previous report showed that hsCRP was strongly associated with all definitions of radiographic OA . However, that study also showed that the association was not independent of BMI, and our data support the notion that hsCRP is not an independent risk factor for new knee symptoms. Similarly, a previous study showed that the radiographic features of OA are associated with bone mineral density of the lumbar spine and femoral neck . However, NTX and CTX, two reliable biomarkers of osteoporosis, failed to predict new knee symptoms. It is reasonable to assume that these current osteoporosis biomarkers alone, or possibly osteoporosis itself, are insufficient to predict the development of knee symptoms. It may be necessary to collect more detailed information about osteoporosis to identify any contribution to the development of knee symptoms.